In a large skillet, cook beef and sausage over medium heat until no longer pink; drain. Stir in pizza and marinara sauces. In a large bowl, combine the eggs, ricotta, Parmesan, parsley and pepper. Spread 1 cup meat sauce into a greased 13-in. x 9-in. baking dish. 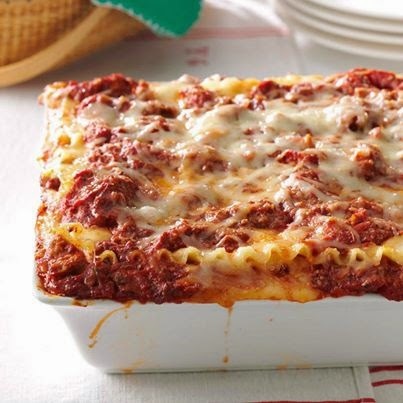 Layer with four noodles, half of the cheese mixture, 1 cup meat sauce and 1 cup mozzarella. Repeat layers. Top with remaining noodles, meat sauce and mozzarella. Cover and refrigerate for 8 hours or overnight. Remove from the refrigerator 30 minutes before baking. Bake, covered, at 375° for 45 minutes. Uncover; bake 10-15 minutes longer or until cheese is melted. Let stand for 10 minutes before cutting.